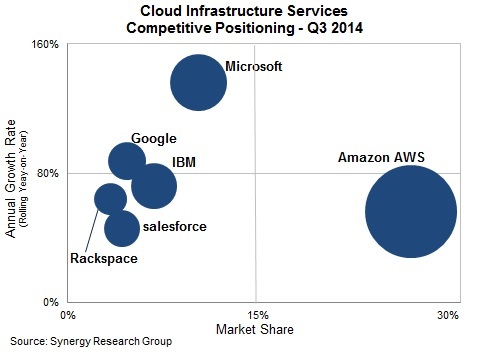 It’s uncontested that Amazon’s cloud is by far the biggest. Details beyond that, however, are mighty scarce. None of the major cloud providers — Amazon or its chief public cloud rivals Microsoft and Google — are particularly transparent when it comes to the revenues and profits they derive from cloud, the number of servers they host, or anything at all, really. That leaves us as the proverbial blind men and the elephant. So here are a few recent snapshots from researchers that may be helpful in fleshing out just how big [company]Amazon[/company] Web Services really is..
Jillian Mirandi, senior analyst at Technology Business Research Group (TBRI), estimated that AWS will generate about $4.7 billion in revenue this year, while comparable estimated IaaS revenue for [company]Microsoft[/company] and [company]Google[/company] will be $156 million and $66 million, respectively. Amazon’s head start in this arena is a big reason for that delta: AWS launched in 2006 while Microsoft’s IaaS equivalent came online in April 2013, and Google Compute Engine debuted widely in December 2013. For now, the situation remains largely as it was in May when Gartner released its survey of public cloud providers. In that report, analyst Lydia Leong wrote that despite heightened competition from Google, Microsoft, IBM SoftLayer and others, AWS remained “the overwhelming market share leader with more than five times the cloud IaaS compute capacity in use than the aggregate total of the other 14 providers” surveyed. Long story short? AWS, the great-granddaddy of public cloud, has built up a prodigious set of services and a huge user base over the past eight years. But it’s now in the unfamiliar position of facing two competitors that can preempt it in price cuts and new features. It’s also trying to woo larger companies that already have lots of legacy IT in place which makes the cloud move more, um, complicated. Many of these companies will require that some of their workloads and data remain in-house, and taht’s where AWS will face challenges from vendors like Microsoft, [company]VMware[/company], IBM, [company]HP[/company] and others that already have lots of enterprise relationships in place. Next week, Google will host another live cloud event and AWS Re:invent kicks off the following week so expect more news then. that is from gartner’s Lydia leong. Nonsense. Microsoft reported nearly a billion in revenue on Azure last quarter, which puts them at about $4 billion/year run-rate. Almost at Amazon AWS level. Where did Gigaom get this $66 million figure from? As the article clearly states, that figure is from TBRI. Not sure where you got $1B in azure revenue. Last quarter, Microsoft claimed that its whole “commercial other” generated over $2.4 billion last quarter. That category includes but is not limited to Azure. Again, not very transparent. Having a lot of inventory is not the best sales argument, though. I’m surprised to see Salesforce in Cloud Infrastructure Services though. I don’t think it’s meaningful to conflate IaaS, PaaS, and SaaS together. yes one reason i didn’t report the Synergy #s in a separate story is that researcher puts everything in one bucket….but then again, doesn’t AWS lump together IaaS and elastic beanstalk Microsoft Azure #s must reflect IaaS and PaaS too. So i am conflicted. Microsoft’s numbers are also nebulous. It’s unclear, for example, how much of that power is for Azure vs. other services that do not yet run on Azure. That is an interesting number, thanks for sharing. But Microsoft’s data centers run a lot of things other than and in addition to Azure.